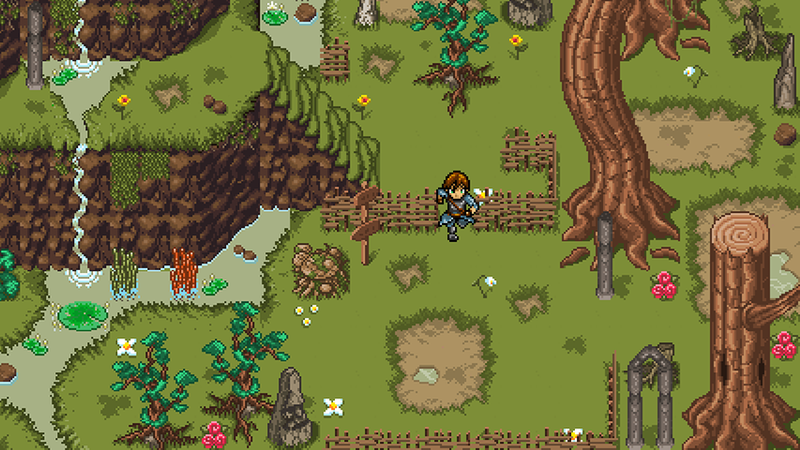 A 2D action-rpg on a low-fantasy setting, that merges the classic fantasy adventures with modern environment. The game has been in development since early 2016. We were inspired by Zelda's dungeons and Kingdom Hearts' battle system. We are implementing different set of monsters and puzzles for every dungeon. The zones of the game will be connected using an open-world approach, limiting as much as possible visible change of maps. The main character is able to concatenate multiple attacks through a combo system. With an ability system we can extend actions, for example a combo increaser or dash attacks. The abilities gives some protection between altered status and elements, or influence how an usable skill can damage enemies. - Extended maps to explore. - Puzzles and gimmicks for each dungeon. - Level-up system to give a sense of progression. - Craft system to build items and equipment. - A compelling story with orchestral musics. We are using a custom game engine called XeEngine built in C++. It primary uses a 2D renderer that offers Z-ordering, atlas textures, a dynamic palette system and multi-platform support (Windows / macOS / Linux). The toolsets are build using C# and .Net Framework, and they works as editor or converter from JSON/XML data to binary files readable from the game. Every component of the team is using git to get and update the game-resources; then the synchronized resources are built from the toolset to test or play the last build of the game. @elrehon: Directory, storyteller and composer. @simonsevenDK: Concept artist, graphics designer and sound designer. @xeeynamo: Tech director, lead developer and game designer. @rck015: Art director, animation artist and pixel artist. 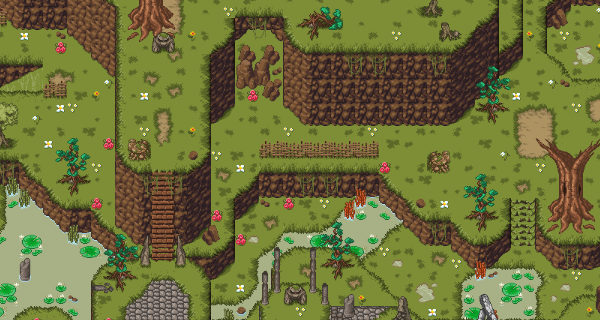 @AngeloPeluso: Environment director, pixel artist, map designer. 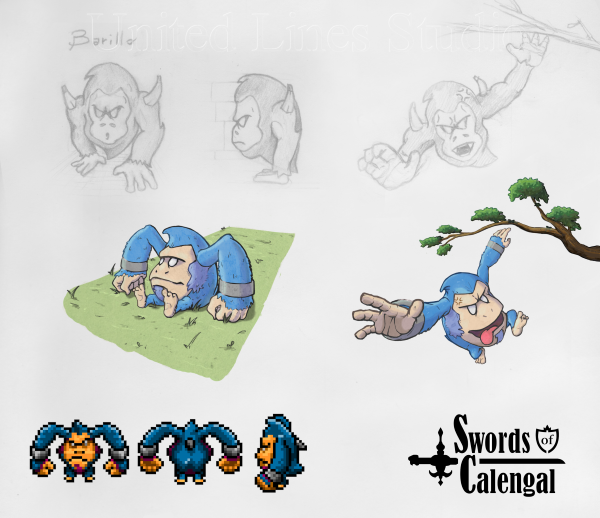 Currently working on Swords of Calengal. Looking good! 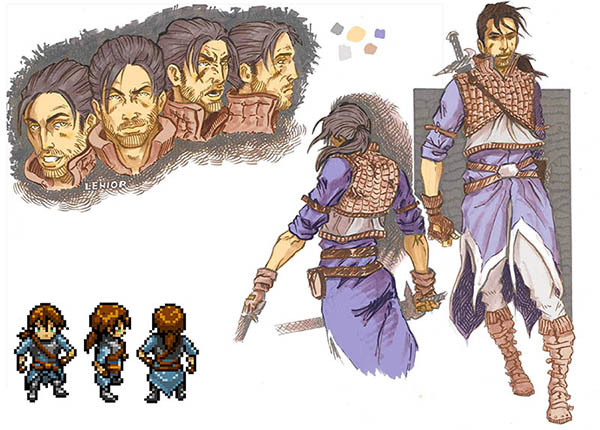 I like the concept art a lot! Thank you :3 our concept artist will be very happy to hear that. Thank you. We spent a lot of time on brainstorming about the game, so the content will be polished enough to be at least decent . Oh, our composer is currently studying your tutorials found on this site! Currently the artists are working on a map, while I'm spending some time to improve the code of HUD management. We still have a lot to show and we would like to receive some feedback on it. As promised, we have some progresses. What we want to show you today is how we are working on menu interface. We love numbers, they give a perfect sense of progression after each level is passed. Who is not happy to deal 9999 health damage after some hours of game? "Health will be shown as numbers to the HUD". When we decided to use a camera size compatible with the fifth generation of consoles we knew that such decision would lead to space problems. A tiny font would fix that and a fixed-size width for each character solves a lot of design problems, but letters as 'I' or '1' makes it less readable. Then a new font was drawn, we added some space to make it more readable but new space issues appeared. After more mock-ups and ideas we reached this version. The vertical gain was 5.4%, a good result indeed. The plans is to use that orange rectangle to put the face of main character, representing different expressions during a fight. A fuchsia bar will keep the player updated about how it's missing to next level up; instead of the name of the main character different information can appear, like the new level reached or the name of current altered status. Due to different hardware, modding purpose or better reaction to future changes, the menu is dynamic to font and resolution. From the steam survey we realized that not all players has 16:9 monitors. We are player first and we really dislike those horizontal black bars because the game cannot adapt itself to different resolutions. The though decision was to support 4:3 resolution, because it force to us to make the game works first on that including the events and cut-scenes. The final result is very pleasant for us, but we would like to receive more feedback from you! Last, but not least, our composer is happy to share the main theme of the game. Let us know what do you think about it! I'm glad I could be helpful to you and your project!!! Graphics is evolving fast. Our spriters are proud to show this partially playable map. Let us know if you like it or if we can improve it more! Wow, this looks really cool! The art looks great, especially the new map! Following! Hi, guys. 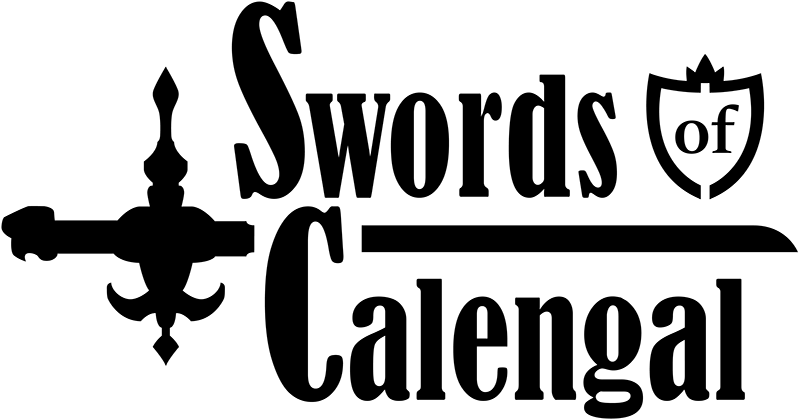 Sorry for this long period of absence and don't worry, we still working hard on Swords of Calengal! After some internal re-organization, we decided to write new updates more frequently! Today we want to show you the first enemy of the game that we ever created, ideated by our concept artist Simone Icardi: the Barillo. The monster has some variants that you can find in different areas of the game. Internally, we are developing a great set of move-sets and some of them will be triggered only with powerful versions of the enemy. Those version are recognized by the player due to different colors or levels of armor. 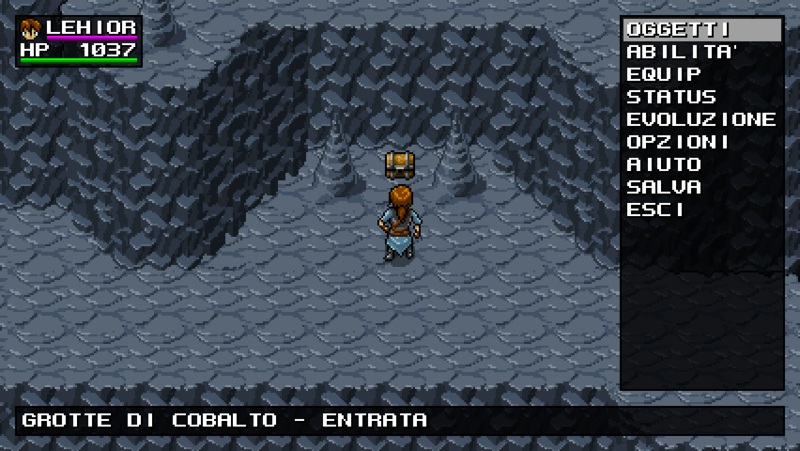 For example we want to use a white palette for snow areas and a gray palette for caves. We created a bigger variant too as a first boss of the game, then it will be a recurrent enemy later to give to the player the feeling that their skills were greatly improved during the game. Stay tuned, we have a lot of stuff to show this March! In those days we are working on a new collision detection system to offer some enhancements on map exploration. We are using some collision events too that allow objects to switch between lowest layer with its collision layer with the higher layer and a different layer. This technique allows us to create up to two different paths on the same point like bridges and underpasses, but it's very error-prone and does not solve completely some problems. Classic RPG does not have this problem because the maximum height of a character is TileHeight*2 but our character is TileHeight*3. 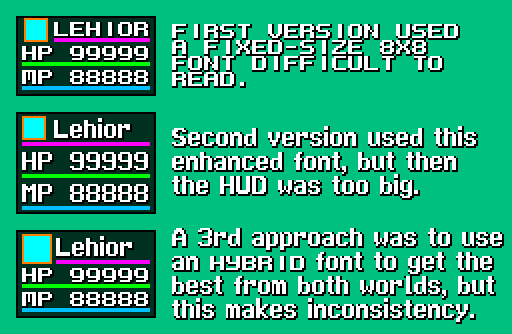 Another solution is to have a minimum collision block of 16x32 instead of 16x16 as now, but it implies design limitations. We are still searching for a definitive solution. The shadow system too needs some improvements. Shadows are always higher than the main character and lowest layer, but some shadows needs to be under the lower layer. We are unable to find a definitive solution here too. Aside those problems, the game itself looks great. We need to improve a lot some things, like a shadow under the main character and enemies, a better A.I., some life to the map and new enemies. Many thanks we are putting a great effort on smooth animation and pleasant graphics! Some gameplay posts will be written during next month or a bit later and we hope that you like it too! Amazing! I agree that shadows under the enemies/character will go a very long way. But aesthetically, you're doing incredible. Keep it up! Hehe we already studied the shadows under the objects (that are different from field shadows) and we chosen the first one from this screenshot. I'm waiting to implement it in-game because there are currently other priorities and I'd like to implement a dynamic shadow that can be bigger or smaller based from the size and the 'Z' coordinate of the object. You are right, shadows is something necessary that is currently missing. Thank you :3 following you too. More gameplay gifs will come later. It works for now, but we have a lot of room for improvement before to show it in details. 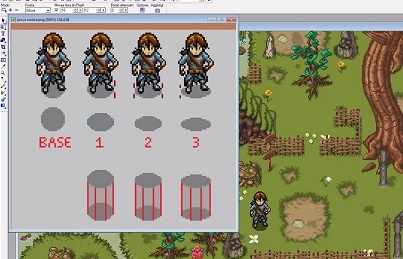 Our solution is to use both tiles and sprites, anything that the player needs to be able to be both in front and behind depending on the sitation is a sprite which is sorted based on both a layer and also its y position. Don't you need to do that for the enemies anyway? Beauty aesthetic and nice animations, great job!
) 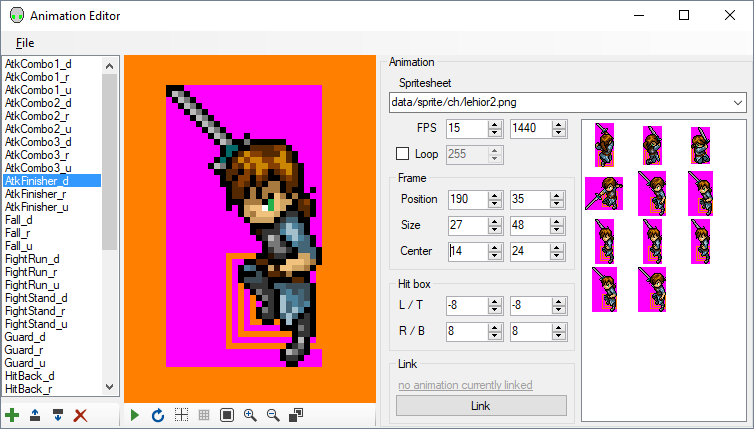 but this implies to abandon Tiled for a tile-editor written from scratch, while I have other priorities right now. Currently the engine browse between entities from a X1 to a X2 based from camera position&size and it's terribly inefficient on vertically big maps and with your solution too. I need to store entities in a quad-tree, partitioning the entire map in chunks.